Many job applicants fail before an interview even starts by not meeting common interview expectations. Teach students the basics — for example, Green Bay Packers coach Vince Lombardi considered his players late if they didn't arrive for team meetings 15 minutes ahead of time2, which is a good rule of thumb for job applicants to follow, too. Bringing a copy of a resume and something to write with are other best practices interviewees should follow. Fifty-three percent of hiring managers and human resource professionals interviewed by CareerBuilder said that dressing inappropriately is one of the biggest blunders interviewees make3. Wearing casual clothes, failing to wear clothes that are clean and pressed, and failing to groom well are other mistakes to avoid. Body language is also important; 70 percent of respondents to CareerBuilder's survey said that interviewees made the mistake of failing to make eye contact, while 44 percent said interviewees failed to smile, and 35 percent cited bad posture and fidgeting. Forty-nine percent of CareerBuilder respondents complained that interviewees make the mistake of answering a cell phone or text during an interview. This type of behavior is not only rude, but it also communicates disinterest, another common turnoff for interviewers, cited by 55 percent of CareerBuilder respondents. Teach students to turn their ringer off and keep phones out of sight. Another common mistake is failing to rehearse answers to common interview questions. For instance, when faced with the most common question, "Tell me about yourself," many interviewees make the mistake of answering with personal information, rather than communicating details that highlight their qualifications for the job. Job applicants should come to interviews prepared with natural, to-the-point answers to common interview questions. 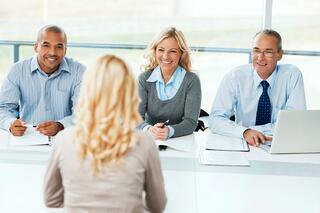 It's also important for interviewees to prepare questions of their own to ask interviewers. Thirty-two percent of respondents to CareerBuilder's survey said that a frequent mistake interviewees make is not asking good questions. Teach students to keep questions brief and focused on the nature of the position, training and career development, rather than topics such as vacation and pensions. It's easy for interviewees to emphasize their educational credentials, but this may fail to impress interviewers who are more interested in experience. Ninety-five percent of employers say they give hiring preference to college graduates with skills that can contribute to workplace innovation, and 93 percent say that demonstrated skills such as critical thinking, clear communication, and problem solving weigh more heavily in hiring decisions than a candidate's undergraduate major, according to Hart Research Associates4. Both on their resumes and in their answers to interview questions, candidates should draw attention to any hands-on training or experience that can help them stand out from other applicants.